Occasionally I get into what I often describe as a “fundraising funk”. The Dale is a lean organization that is entirely dependent on the financial support of others to do what we do. During my so-called funks I begin to wonder where the next little bit might come from, sure that I am at the end of ideas. Fortunately these times are often short-lived. 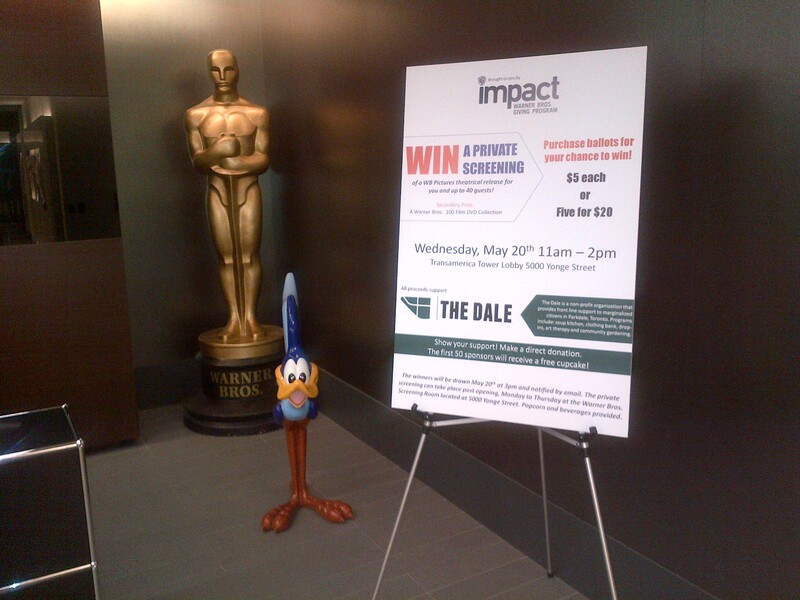 Not one has ended quite as surprisingly as my last one though, screeching to a halt when I received an e-mail titled: “The Dale Fundraiser at 5000 Yonge Street on May 20th, 2015”. The body of the e-mail went on to explain that the Warner Brothers Donations Committee had decided to support The Dale by holding a raffle, the grand prize being a private screening of a theatrical release for you and up to forty people. I was invited to be present on the 20th in order to share the story of The Dale. Apart from being a wonderful shock, I knew this was an amazing opportunity. My husband and I went to the movies just before the fundraiser and when the WB logo filled the screen I elbowed him, feeling a swell of gratitude that such a company would take notice of The Dale. I want to publicly say thank you to Warner Brothers for believing in our cause and making an impact. It means a lot that you would come alongside The Dale as we work to build community that is safe and respectful for all people, particularly those who are touched by poverty. I was sitting in the Coffee Corner at the Thrift Store during our Tuesday Drop-In. A quiet woman from the community who I’ve been slowly getting to know over the last few years asked me, “what did you do to prepare for mothering?” A good question and one that I realize I’m not often asked. I paused, thought and replied, “I was privileged to have a wonderful example in my own mother”. I come from a long line of women who were able to have children and be exceptional mothers. I always wanted to be a mother myself because of them, often imagining that I would have a few children. I slowly had to come to terms with the reality that I was to have one child (our beloved Cate), learning along the way to appreciate the struggle one feels when fertility is an issue. I also discovered that my maternal instincts existed in relationships beyond the one I have with my biological daughter. Sometimes I talk about how this “probably” had something to do with my choice of vocation. Of course, if I am honest I should replace the word “probably” with “certainly”. I always wanted to find work that reflected my passion. With all of this in mind, I paused on Mother’s Day to consider: the gift that my mother is to me; the challenge it was to have Cate, her beautiful arrival and how hard it is to remember life without her; the number of women who have spiritually and emotionally mentored me; the fact that I have a step-mother and mother-in-law who love and support me; the children I have the pleasure of watching grow; the Dale community and my “motherly” role in it. I also invited The Dale to acknowledge Mother’s Day in all of its complexity. For many people in our community mothers are gone because of either estrangement, abandonment or death. Some people grieve the inability to have children of their own while others remember the children they gave up. What binds all of these layers together though is a deep desire to be loved and to show love, a truth that my friend at the Thrift Store shared as a part of our conversation that day: “I won’t ever be a mother in the traditional sense, but I would still like to learn how to love like one”. Should we all. The Dale Ministries Board of Directors is six people. They provide financial oversight, ensure proper governance, monitor programs and offer accountability and support to me and by extension, Joanna. Over the last number of years they have balanced the need to be both cautious and brave as we move forward as a lean organization without our own walls. With their prayerful guidance we continue to grow and discover what it means to be confident in God’s provision and stability. Simply put, I do not know what I would do without this group. I feel cared for by them as a Director, but also as a friend. They carefully listen to my reports about programming, concerns about the community, fear about my abilities and stories from my life outside of work. I know they have my back and I hope they know I have theirs. Thank you to those Board members who came before my time and paved the way, to those who recently finished their tenure, and to those who are serving now. I feel fortunate to be on your team.